Yes, I know that this isn’t the right order. The reason I saw this film is because it was part of the curriculum in my Film Studies class. And since this is the one class I actually care about, I saw the film. I will be going back and talking about the films I missed, but that may take a while. I think I’m going to want to focus on Film Studies first. Randle MacMurphy (Jack Nicholson) is a criminal who pretends to be mentally ill, figuring that a mental institution would be better than jail. He fools the nurses and even manages to befriend some of his inmates. However, he soon discovers that the head of the institution until further notice. The first two acts of this film are very well done, and do set up he film’s dramedy atmosphere to a tee. Only at the third act does the film lose it’s edge slightly, and it ends on a really bittersweet note. Other than that, though, the film does have a well written script, and the editing moves along at a good pace. The story is interesting, for the first two acts anyway. Personally think that the glue that holds this film together is Jack Nicholson’s performance. He portrays Randle MacMurphy as a laid-back guy with just the right amount of drama, making a character I can root for. Then there’s Louise Fletcher’s performance. I had heard a lot of good things about this performance, and the last time a Best Actress winner was in a Best Picture was way back in 1942 with Mrs. Miniver. Naturally, I was expecting a great performance. And while she’s not that bad, she mainly seemed to be confined. I kept waiting for the one big scene where she would let it all out but it never happened. Plus, the role is more supporting than lead. Speaking of supporting, we also get some great supporting players such as Brad Dourif and Will Sampson. Ad keep your eyes out for Danny DeVito and Christopher Lloyd! The film’s ensemble work very well off one another, and it’s clear they had some great directing. 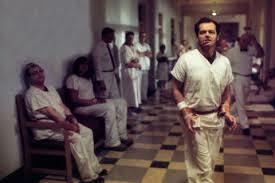 Although not perfect, One Flew Over The Cuckoo’s Nest is a really good film that stands the test of time.